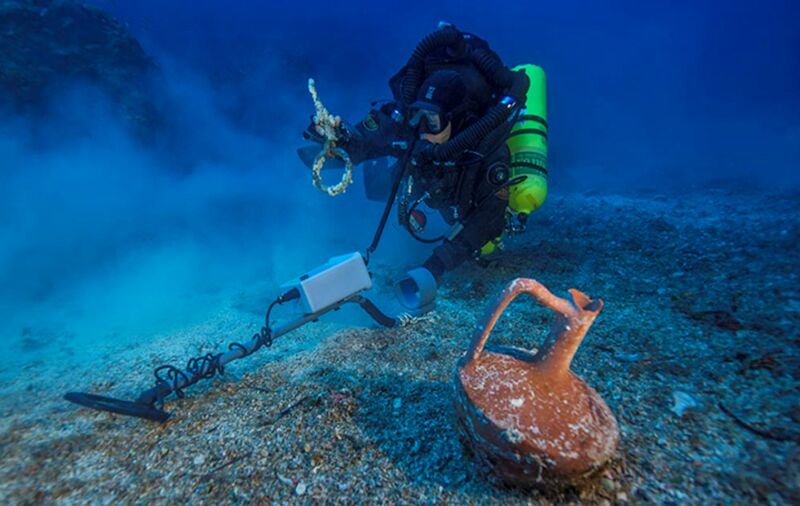 In 2015, researchers began carrying out a five-year study of the ancient Greek shipwreck off Antikythera Island that had onboard the famous Antikythera mechanism, hailed as the world's first computing device, as well as other treasures. An analysis of the wreck at that time identified two areas with artifacts and ship remnants, leading archaeologists to believe that there may have been another ship that went down simultaneously. Alternatively, the two areas of remnants may be separate parts of the Antikythera wreck after it split in two. Greek officials approved the extension of studies of the ancient vessel, which may have been 50 meters (164 feet) long. Researchers are expecting to find more treasures from the ship, which is located at the bottom of the Aegean Sea, in the south of Greece. This time they will focus on areas where they've found metal objects and pottery in the past. "The evidence shows this is the largest ancient shipwreck ever discovered," Foley said. "It's the Titanic of the ancient world." Although the skeleton is a remarkable find, one of the most significant artifacts recovered from the wreck is an object now known as the Antikhythera mechanism , described as the world’s first analog computer. After decades of research, scientists were able to determine that it shows the positions of the sun, moon, and planets as they move through the zodiac, predicts solar and lunar eclipses, and even marked key events such as the Pan-Hellenic games. The discovery of this unique form of ancient technology, along with other treasures, including finely carved bronze and marble statues, glassware, jeweler, and coins, have led researchers to wonder what else may lie within the shipwreck. The ship probably sank between 70 and 60 BC and is believed to have been carrying Greek luxury cargo to Rome. It may have been sailing from Asia Minor. In the first phase of the studies, in 2014, researchers found multiple lead anchors a meter (1.1 yards) long and bronze rigging with some wood still attached. The wood proves that much of the ship has survived over the centuries. Wooden planks, artifacts, and other debris are spread across 300 meters (360 yards) of sea floor. The hull planks and large anchors proves the ship was up to 50 meters long. A group of Greek sponge divers returning from North Africa discovered the wreck in 1900 when they ran into a severe storm. At the island of Antikythera, the divers anchored their boat, and waited for the storm to subside. While on Antikythera, some of the crew decided to dive along the island’s coastline in search of clams for a meal. One of the divers, Ilias Stadiatis, stumbled upon something far more remarkable – the remnants of a ship that laid at a depth of between 42 and 50 meters (137 to 164 feet) under the sea. Stadiatis even brought an arm from a bronze statue from the wreck to his companions. The captain of the boat, Dimitrios Kontos, alerted authorities in Athens about the wreck. A vessel of the Hellenic Royal Navy was sent to Antikythera to aid recovery operations. Later a civilian steamship and Greek Navy torpedo boat were also sent to the island. Representatives of the Greek government, the crew and the sponge divers on the deck of the Greek navy ship Mykali in winter 1900/1901, pulling up objects from the Antikythera shipwreck ( Wikimedia). Over the next couple of months, Greek divers made a great effort to salvage the wreck. At that time, the standard diving equipment was a thick canvas suit and copper helmet. The divers salvaging the Antikythera Shipwreck had only one of these suits to share, and each diver only dived for 10 minutes, twice a day. Due to the extreme depth, the recovery operation was highly dangerous and in the process two divers lost their lives and one was paralyzed. Because of the dangers of diving at such depths and the lack of more sophisticated equipment, the salvage operation could not continue. It was only in 1953, and again in 1976, that the famed French explorer Jacques-Yves Cousteau briefly visited the site of the Antikythera Shipwreck. Apart from these two intervals, the site remained undisturbed for decades. Although no further explorations were carried out, there were enough artifacts from the site for archaeologists to date the wreck. In September 2014 investigation of the Antikythera Shipwreck resumed under the ‘Return to Antikythera’ project. Armed the latest technology, the research team is set on unlock the secrets of the wreck. Using mixed gas closed circuit rebreathers and the Exosuit, the divers of this project are in a much safer position than their predecessors. An autonomous robot carrying stereocameras and sonar was employed to map the site.